Trump Parrots This Morning's Fox & Friends - Joe.My.God. President Trump on praised a book titled “Reasons to vote for Democrats” that is filled with blank pages following a Fox News segment on the book. 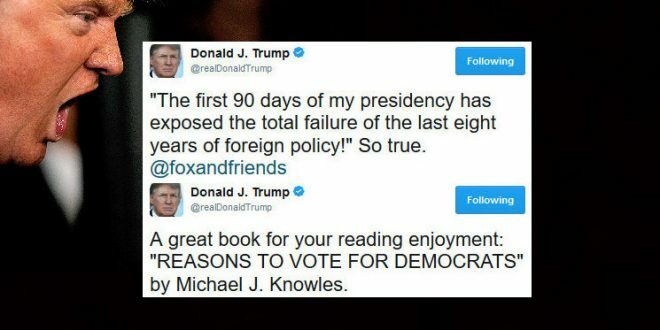 “A great book for your reading enjoyment: ‘REASONS TO VOTE FOR DEMOCRATS’ by Michael J. Knowles,” Trump tweeted. Knowles appeared on Fox & Friends earlier Monday morning to talk about the reaction to his book, which became a best seller last month. The book is filled with blank pages as a satirical statement about Democratic policies. President Trump also agreed with a Fox News assessment of President Obama’s foreign policy, saying it was “so true” that his foreign policy is more effective than Obama’s strategies.